Learn the procedure to find out the hot and cold spot in stability chamber to monitor the temperature and humidity in daily routine. Everything from pharmaceutical products to personal consumer products is tested in stability chambers to get an accurate reading of conditions to be stored in. This process is absolutely foremost to be considered for FDA approval, the FDA requires proper testing and evidence of tests performed to monitor how products react, taking temperature, humidity and various other conditions into account. 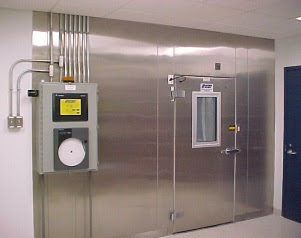 To determine the hot and cold spots in stability chambers, a plan is to be made in order to lay out the purpose of the prospective experiment and what is to be acknowledged from the research, what hurdles will have to be taken into account and what equipment is going to be used along with the determination of number of sample locations. Moreover, a number of repetitions to ensure reliability, duration of single readings, the frequency of monitoring readings and further tests to be conducted for more efficiency are also to be considered. Once a plan has been made, the data loggers are to be analyzed to verify if they are to be used for experiments of the sort and whether they are in calibration. Once, this is done and the loggers are ensured to be accurate, i.e. have not been damaged and are in calibration, they are set up. Next, the starting and stopping times are set up in the mapping software and all the loggers are synchronized to allow precise readings, it is best to delay the initiation and ending times on the loggers to allow them to adjust the temperature and so that the chamber can stabilize. Then the loggers are placed in accordance with the plan, normally loggers with internal sensors are placed in layers on all four corners of the chamber and one is placed in the center whilst one is placed outside. If probes are used, precautions are to be taken to ensure they do not come into contact with the surface of the stability chamber mapping. The external logger may also monitor humidity and is to be placed away from compromising locations such as heat-radiating objects or vents and windows etc. Moving on, once everything is in place and the mapping interface is up and running the loggers are checked from time to time to guarantee everything is going as per schedule. A "flat cable" can be used in order to check a single logger without disrupting the entire chamber. Once a considerable number of readings have been taken and the experiment has been repeated the specified or outlined number of times, the data is collected and findings are made to temperature mapping report. To conclude, this process can determine temperature variations in a chamber and is an approved method to find data regarding storing, packaging and interpretations can be made as to how products would respond when exposed to certain environments. An error of ±0.2°C is acceptable for temperature and an error of ±3% is good for humidity.